Robert De Niro in Deer Hunter on set in Washington state, near Mount Baker. 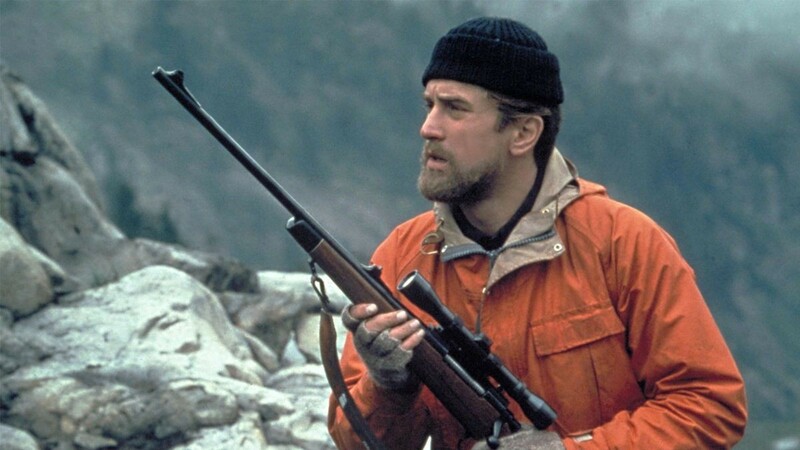 One of my favorite movies is Deer Hunter, turning 40 this year. It's a weird movie, and its portrayal of the Vietnam War is a good example of how Hollywood often gets it wrong when it comes to war. But as a veteran myself, the movie is most compelling in its depiction of the ordinary lives of veterans after they return home. Just before Veterans Day, I asked a few local(ish) writers who served overseas about which movies they find relate powerfully to the military or veterans. "It is difficult to concisely describe how and why I sometimes become so emotional about my service in the war in Afghanistan ... But it is because of this emotional challenge that I have not watched many of the movies set in our modern wars ... I haven't yet watched The Hurt Locker, Restrepo, Osama, Lone Survivor, 12 Strong, or others because I can never seem to find two hours in my day when I'm willing to be so upset ... I did enjoy Iron Man. It's not, strictly speaking, the most realistic war film ... but I would have been happy if they would have stretched out that part where Iron Man fights the Taliban in Afghanistan. An hour and a half of Iron Man destroying the evil Taliban and saving the good Afghan people? Yes please!" "No joke, James Cameron's Aliens is my favorite war film. Future space Marines with serious attitude problems use wearable chain guns to fight xenomorphs at a desolate space outpost. What's not to love? Really though, it's one of my favorite depictions of soldiers to return to because it complicates the narrative we're often sold in the Post-9/11 era of the quiet, dutiful, consummate professional, who's probably damaged by post traumatic stress and growls hard truths while giving a thousand-yard stare."